CANTON, MA (May 7, 2015) -- Dunkin’ Brands Group, Inc. (Nasdaq: DNKN), the parent company of Dunkin’ Donuts and Baskin-Robbins, today published Broadening Our Horizons, the company’s third Corporate Social Responsibility (CSR) report. The report outlines Dunkin’ Brands’ ongoing commitment to sustainability efforts to meet the needs of its franchisees, employees and guests, while serving local communities responsibly and protecting the interests of the planet. Broadening Our Horizons details the progress Dunkin’ Brands has made in the past two years against goals outlined in the company’s 2012 CSR report, Focused on Sustainable Solutions, and sets new goals for the future in the areas of sustainable building, packaging, product sourcing, nutrition, supporting local neighborhoods and more. Sustainable Building: In 2014, Dunkin’ Donuts launched DD Green Achievement™, a program designed to help U.S. Dunkin’ Donuts franchisees build sustainable, energy-efficient restaurants. Dunkin’ Donuts has set a goal of developing 100 new DD Green Achievement restaurants by the end of 2016. Dunkin’ Donuts also set a goal to launch DD Green Achievement for U.S. Dunkin’ Donuts restaurant remodels by the end of 2015. Dunkin’ Brands will publish an interim progress report on DD Green Achievement in 2016, including baselines for energy and water use, reduction targets and achievements to date. The company has also set a goal of increasing single-stream recycling rates at its corporate headquarters in Canton, Massachusetts by 15% by the end of 2016. Sustainable Sourcing: In 2014, Dunkin’ Brands announced a commitment to source only 100% sustainable palm oil in the United States by 2016. Dunkin’ Brands will work with its suppliers and its franchisee-owned purchasing cooperative to source palm oil that is 100% fully traceable to the mill by the end of 2015, and to the plantation by the end of 2016 for use in Dunkin’ Donuts U.S. restaurants. To further its commitment to ending deforestation, Dunkin’ Brands also plans to issue a global sustainable paper and pulp policy for Dunkin’ Donuts and Baskin-Robbins by the end of 2016. In 2015, Dunkin’ Brands also announced new animal welfare commitments in partnership with the Humane Society of the United States. Ten percent of all eggs sourced for its breakfast sandwiches in the U.S. will be cage-free by the end of 2016. Dunkin’ Donuts will also map its international supply chain to understand the feasibility of transitioning to 100% cage-free eggs globally, and, based on this assessment, establish a global target with interim deliverables towards this goal. Additionally, Dunkin’ Donuts will source only gestation crate-free pork in the U.S. by 2022. The report also highlights the 2014 launch of Dunkin’ Donuts’ new 30% Rainforest Alliance Certified™ Dark Roast Coffee, the brand’s first national launch of a certified product since the 2004 launch of 100% Fair Trade Certified™ Espresso. Packaging: As part of Dunkin’ Donuts’ commitment to roll out an alternative to foam, the company continues to examine every commercially available cup and material. Dunkin’ Donuts is currently testing a double walled paper cup and a #5 recyclable polypropylene cup in limited markets. Dunkin’ Donuts’ goal is to establish a phased implementation plan and timeline for a transition in the U.S. from foam by the end of 2015. In 2010, Baskin-Robbins pledged to explore alternative materials for its famous pink spoon, an iconic symbol of the brand. In late 2014, the company began transitioning the spoons in U.S. Baskin-Robbins restaurants to a #5 recyclable polypropylene plastic. Nutrition: Nutrition remains a key priority for Dunkin’ Brands, and the company is committed to offering great-tasting food and beverages that meet many different dietary needs. By the end of 2015, Dunkin’ Donuts will roll out new guidelines for its DDSMART® menu of better-for-you choices, including calorie, sugar, sodium and saturated fat thresholds. Dunkin’ Donuts continues to work toward goals to reduce the sodium content across its U.S. menu by 10% by December 31, 2015, and to reduce the sugar content in its U.S. beverage portfolio by the end of 2017. Baskin-Robbins will also test new smoothies with a reduced amount of sugar and calories in the U.S. in 2015. Supporting Neighborhoods: Dunkin’ Brands is passionate about helping people, one neighborhood at a time. From 2011 to 2014, the company’s franchisees donated more than $20 million to non-profit groups in the U.S. alone. The Dunkin’ Donuts & Baskin-Robbins Community Foundation (DDBRCF) raised a record $3.2 million in 2014 to support its mission of serving neighborhoods through hunger relief, children’s health and safety initiatives. These results were driven in part by The DDBRCF’s first in-store fundraising program, which raised $540,000 with guest support. The DDBRCF also expanded its national partnership with Feeding America through a $1 million commitment over three years, the largest donation in The DDBRCF’s history. Funds support Feeding America’s Food Pantry and BackPack program helping children and their families at local food banks across the country. More details can be found in The DDBRCF’s 2014 Neighborhood Impact Report which can be accessed here: http://www.dunkinbrands.com/foundation. 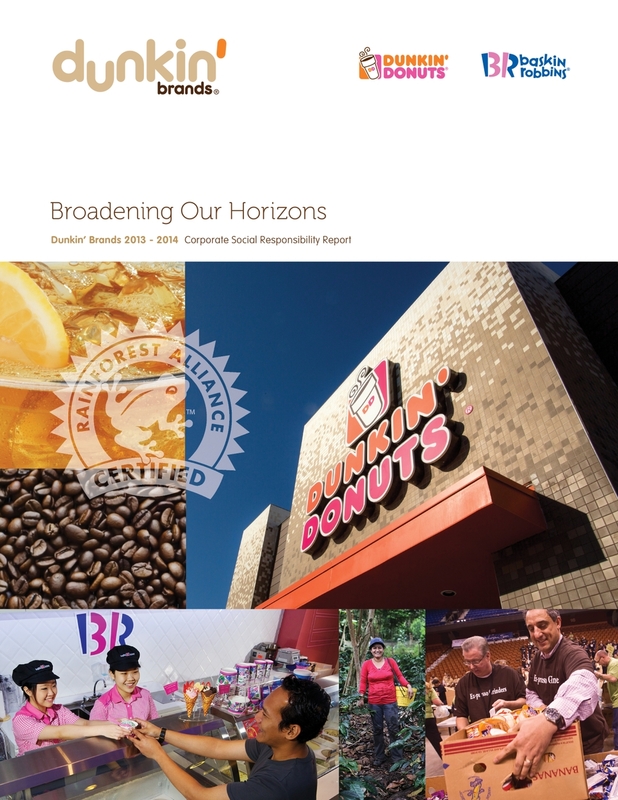 To download and read Broadening Our Horizons, or to learn more about Dunkin’ Brands’ CSR initiatives, please visit http://dun.kn/CSR2014Report. With more than 18,900 points of distribution in nearly 60 countries worldwide, Dunkin' Brands Group, Inc. (Nasdaq: DNKN) is one of the world's leading franchisors of quick service restaurants (QSR) serving hot and cold coffee and baked goods, as well as hard-serve ice cream. At the end of fiscal 2014, Dunkin' Brands' nearly 100 percent franchised business model included more than 11,300 Dunkin' Donuts restaurants and more than 7,500 Baskin-Robbins restaurants. Dunkin' Brands Group, Inc. is headquartered in Canton, Mass.